Polyform and its environment division joined forces with Polyvert Recyclage for collection and recycling services. 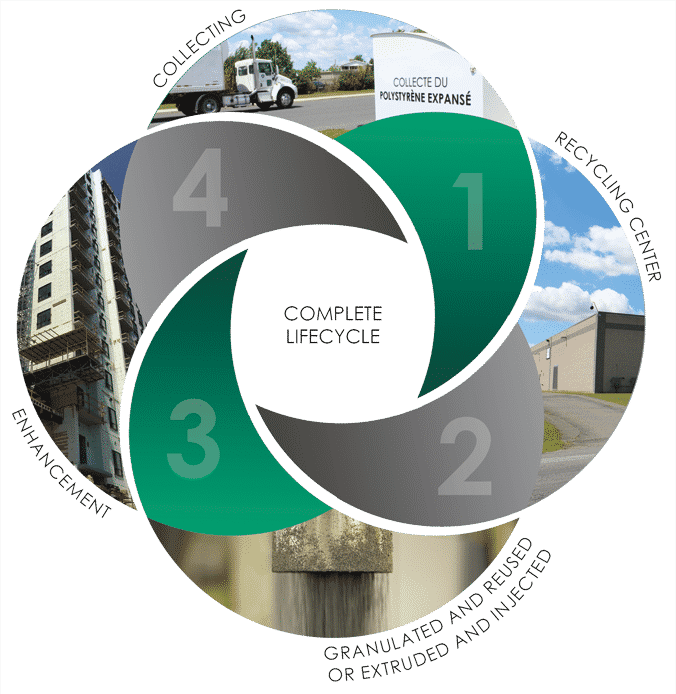 We use a technology allowing us to transform all polystyrene and polypropylene waste. These recycled materials are used in the manufacturing process of many expanded plastic products and transformed for manufacturing of rigid plastic parts. All the recycled material surplus is redistributed on the market as raw material. Polyform’s first series of investments in this division was done in 2012 when creating its own recycling plant. The annual capacity of 5,000,000 kg of plastic material has been reached quickly. In 2017, Polyform invested once more, this time building a new plant that would triple its plastic recycling capacity. Partnership with Polyvert Recyclage started in 2018 for a better management of material recovery, increased collection efficiency, and high-quality standards. We are now in a better position to meet the market’s positive demand, the increasing volume of collected material and more frequent collects. Want to recycle your polystyrene waste but don’t know where to go? A recycling container is available at the Polyform offices (454 Edouard Street, Granby, Quebec) for the public to leave their clean expanded polystyrene packaging. You can bring your recyclable material to this deposit point, whenever you want. Polyform set up many recovery programs for large quantities of industrial waste of #6 plastic. For more information, click here to see our available programs. Polyform developed its own four-steps scheme for plastics valorization: Recovery, recycling, transformation, and valorization.